Continuing the journey in Sense/Net, after my first post where I highlighted some hints to speed the process of creating a development environment, I want to spend two words on the following Sense/Net wiki how-to: How to create a ContentHandler. It explains how to create a content handler for the content types you may have included in your custom business logic. Btw, "Content Type" is an important bluilding block of Sense/Net platform: it is a collection of reusable settings that define the attributes and behaviours of a specific kind of content. 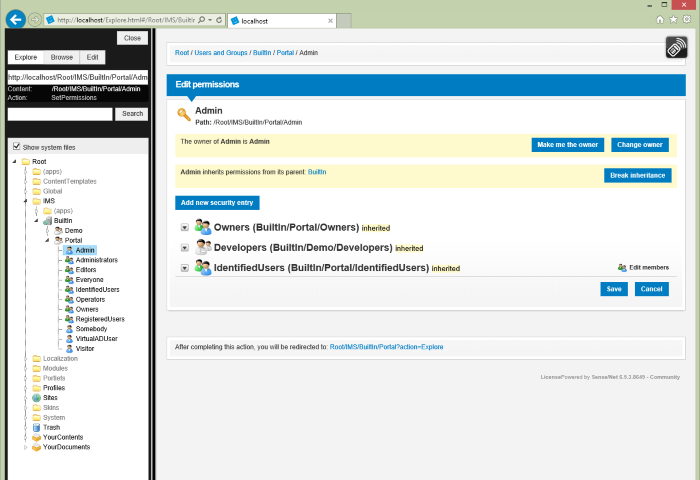 From a conceptual point it is identical to a Sharepoint Content Type, what differs is the implementation. The how-to above mentioned is clear and easy to follow, but on point 7, after the creation of the content handler, it suggests you to install the relevant content type through the on-line Content Repository. This is not what I want, because you may end with the result of a content handler not aligned with the content type previously defined, it is up to you to keep them synchronized. Why not install or modify your content type during the building process? After all, this would be the best way to keep in sync both the content handler and the content type. if you do not have the full tree but just the Root folder, create it from inside Visual Studio. 2. Add a post-build event. 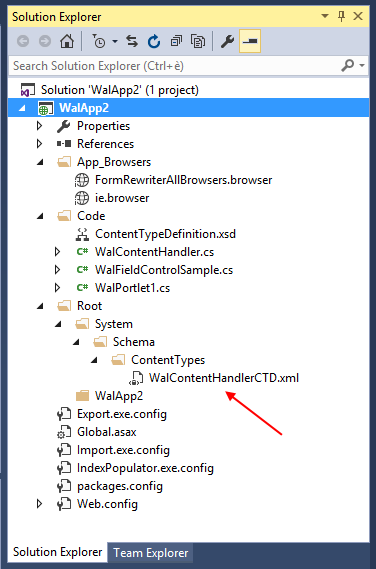 The first line imports in the content database what is contained in the Root folder of your web app. The second line runs indexpopulator.exe to reindex the content repository. Make sure you have import.exe and indexpopulator.exe tool on your bin webfolder. The architecture of Sense/Net allows you to define a content type as a set of properties and attributes to be assigned to a specific kind of content, in a way that is very similar to what Sharepoint does. This is great because you do not have to rethink integrally to your project from the basis if you want to migrate it to Sense/Net. 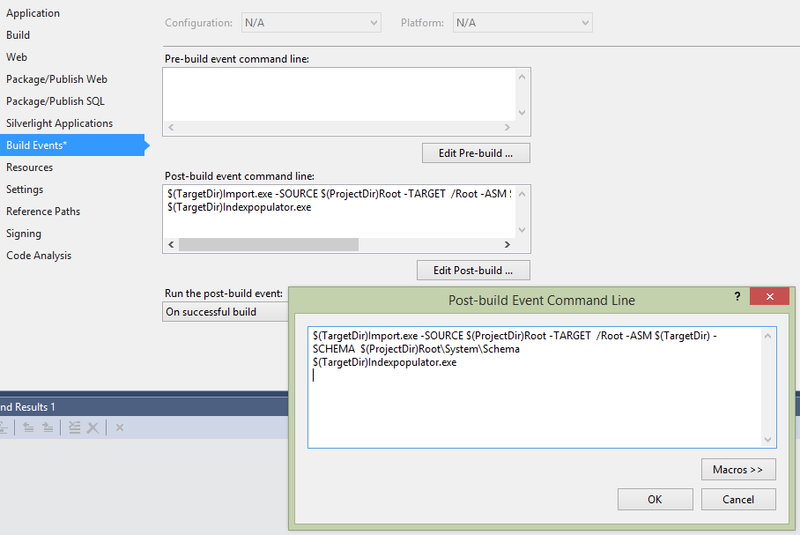 In this post I showed how we can leverage a post-build event of Visual Studio to ensure that both the content handler and the content type are installed at the same time so that you can minimize wrong reference errors. This trick may be applied to other cases. This is the first post of my journey with Sense/Net. Recently my company wanted to broadening its CRM services, looking for an alternative to custom Sharepoint solutions, better if open source. Looking around, we found a very promising product: Sense/Net (sensenet.com). Sense/Net is an ECM system which claims to be an alternative to Sharepoint. It includes features like workspace-based collaboration, document management, business process management, web content management and, last but not least, is open source. The question is: is Sense/Net really comparable with Sharepoint in terms of features? Answering to this question would require to map each feature of Sharepoint to the corresponding feature of Sense/Net. This is an exercise I'm not going to do. Instead, for a subset of features that we are interested in, we want to verify on what extend they are supported by Sense/Net. I mean "verify" from a developer point of view. So, one of the things we appreciate of Sharepoint is the possibility to customize and add new functionalities through a series of project templates in Visual Studio that provides you with a skeleton of a basic project or a Visual Web Part and so on. Once you created your project you can easiliy add new items from a list which includes for instance event receivers, web parts, workflow, business data connettivity etc. Sense/Net does not provide you with similar "amenities", at the time of writing. What it is suggested on Sense/Net wiki page is to set up a development environment through 14 steps. Let's give a try. My test was made on a Windows 8.1 machine with IIS 8.5, Visual Studio 2015 and SQL Server Express 2012, using Sense/Net community ed. 6.5.3.8649. To be honest, I struggled a bit before to have a working environment, but at the end I was able to start my web application and even debug it. Here are some hints to speed up the setup. Point 1 requires you to install an MSBuild Extension Pack, without specify which version, x86 or x64. I experienced that x64 choice is the wrong one, so.. install x86 version. On Point 3, in the connection string in your Web.config, set "Data Source =.\sqlexpress.." instead of "Data Source =." if you are using Sql Express. The same consideration is valid for point 5, when editing the connection string of the config files. Point 7 requires you to create the folder "SenseNetReferences" and copy in it all dlls from the Sense/Net webfolder bin. After that you have to reference a short list of some of these dlls in your web application. I experienced that it is not enough. I started by adding one by one the missing references according to the build errors; after 10 additions I got bored and referenced all was in "SenseNetReferences" folder and that worked. On Point 10 you have to create a deployment batch file to create the database and the initial environment. Apparently, once the batch file ended its work and after you set up an IIS web site for your web app as in point 14, all seems OK, but.. when you navigate on localhost for the demo Sense/Net web site and log in as admin user, you'll experience a lot of permissions issues, for instance you (as admin) cannot navigate through the Content Explorer tree, instead, the predefined developer profile can. The developer profile can open the root console but the admin cannot. On a deeper investigation I found out that admin user did not belong to the Administrators group. I simply copied this option from the "InstallSenseNet.bat" file that you can find in the Sense/Net source code.I guess it was forgotten in the wiki page. From this first taste, I can say that Sense/Net does not offer anything out of the box in terms of Visual Studio templates, add-ins etc that makes developer's life a bit easier. Set up a working development environment, as I did, it is whitin the reach of any developer, but some might be discouraged given the number of steps required. I think it could be worthwhile to create a a VS template that allow to save some steps. On the other side, you have the source code to look into in order to solve any issue you may encounter and this is, in my opinion, a great added value. Let’s suppose you want to create a pdf as a result of a mixture of data and information coming from different sources; and, suppose you want to automatize the creation process. After some investigation I got just the thing: PDFsharp & Migradoc library. It is a double-face c# library, double-face in the meaning that it provides a low level library (PDFsharp) to interact with pdf objects and a high level library (MigraDoc) which adds an abstraction layer that allows to think in terms of sections, headers, chapters, paragraphs etc. Create all the sections needed for the document included those which will be populated by external pdf files. Create all the bookmarks needed when creating the sections above; this step is important for the internal links to be correctly resolved and the table of contents to be build accordingly. In fact, if you add content with references to parts of document which at the time are not present, you get an unresolved link error. It does not matter if they are filled with content or they are just blank pages at the moment, what matters is that they exist and are bookmarked. Fill the remaining parts of the document importing Sharepoint data and mdddl files. Create the table of contents. Add page numbers. This action at the end of all the operations to be sure not to exclude any pages. Let me skip the “getting started” part of PDFsharp& MigraDoc, you can find exhaustive tutorials on the product web site, and jump to the interesting parts. // Create a new MigraDoc document. // Add the "intro" section to the document.